Little league Baseball season is upon us and today is the first day of a home and home series. The visiting team is Mom in the Muddle. Karen is the coach, eh blogger, at Mom in the Muddle. 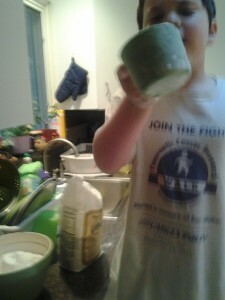 She blogs about stumbling through parenthood at Mom in the Muddle. She writes, edits, parents, and whips up last-minute dinners while trying to survive her kids’ math homework. I enjoy Karen’s blog very much and look forward to each post. So after reading her post here, make sure to go check out Mom in the Muddle. I’m pretty sure it was one of the reasons I stopped playing. I knew it even then. In fourth grade, I played softball and I wasn’t very good. When the ball was hit to my patch of centerfield grass, I ran for it and threw it in. I threw it to whoever looked most eager to get it in her glove. Only my aim sucked. My eyes looked at her outstretched hand, but the ball went six feet to the left. As a parent, I’ve sat on the sidelines through enough games and enough sports to know that I’m not cut out for this sort of thing. I hate sitting in the stands, hearing the other parents. My kids are 8 and 11, and I already hate the other parents in the stands. I hate hearing them chuckle when a kid messes up, and not just my kid. 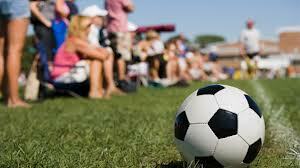 I hate the parents who scream at the top of their lungs to their own kid, “Shoot the ball! Get it, Bobby! GET IT! GET IT! GET IIIITTTTT!” I wonder whether I’m going to have to slide over when the guy’s heart attack kicks in. I hate the parents who forget that these kids are still learning the game, and this is not the big leagues, folks. I hate the coaches who teach the kids to push the rules. I get angry at the kids out there who call the other kids “asses” and bully them so hard that you have to have a talk with your kid after the game about being the better man and good sportsmanship—when the talk you really want to have is, take that kid down. I’ve heard parents laugh at my kids, yell at them, and yell at their own during all sorts of sports through the years. I’ve had to get up and walk away. I’ve learned to sit on the grassy hill to watch baseball games, on the other end of the field during soccer games, and on the floor against the wall during basketball games. I try not to sit with the other parents. One man last year yelled so loudly so often at his son during a game, that I had to cover my ears and finally had to move. My son told me later he was glad my husband and I didn’t do that. I do a lot of clapping during the games. I clap for my kids and other kids. I talk under my breath. A lot of times I just sit there and watch. I remember how hard it was to be out there with so many eyes watching. Some kids are naturals. Some kids aren’t. Some kids will work hard at it and get through all that. But they don’t need some jerk in the stands to crush their spirit. I know I never was a great athlete. I didn’t want to be. But I’ve learned more in the past eleven years about throwing a ball, shooting a basket, and kicking a soccer ball than I ever did during my own childhood because now I don’t have grown bullies bringing me down. BR & SJ headed off to camp. Yes, I gave them a ride. I love Summer Camp. I am in my early 40’s, and I love Summer Camp. It is a beautiful and wonderful thing. boys out of the house early. 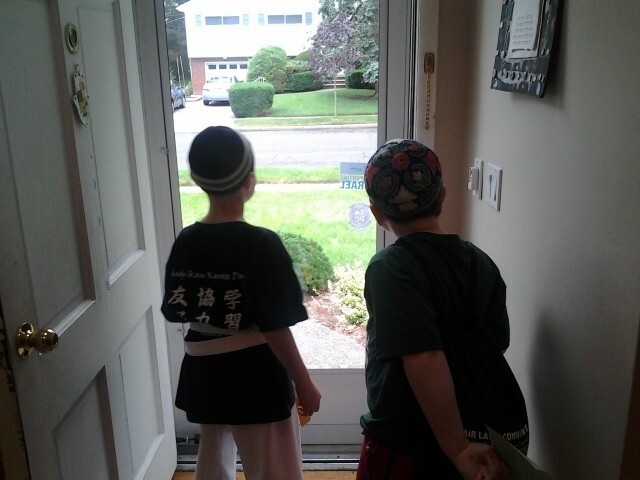 boys staying out of the house for hours at a time. Yes, Summer Camp is awesome! In fact, Summer Camp is my ticket to heaven on Earth. I get to hang out on a deserted island. Deserted of people that is. I am home alone (by the way, I recently watched those movies with my boys, and we loved them). Movie Poster courtesy of Google. For the record, I do love my family and enjoy spending time with them. Well most of the time I love them, but that’s another story. Anyway, I am a subscriber to absence makes the heart grow fonder, distance is a good thing. There is truth in those sayings. You may be thinking what does Mrs. MMK think about this? She is not offended at all. She is the same way – loves to have some space. Anyway, I never get the house to myself. In fact, if you added up all the time I was home alone from September till June, it would come out to 92 minutes and 23 seconds. Or something like that. 1. I went to the bathroom and left the door open. My wife hates when I do this. Sometimes, I actually leave the door open when she is home figuring that she won’t be coming up the stairs anyway. I can’t tell you how many times I had to quickly shuffle over and shut the door so my wife does not see me committing this cardinal offense. 2. I watched a full episode of Everybody Loves Raymond. Yeah, I know the show has been off the air for eight years already. But I like it and besides, I never saw this episode. It’s called Blabbermouths and the characters gossip about each other. It was entertaining and educational. I laughed loudly and held the remote and no one cared. 3. I ate lunch – slowly and care free. I did not think about getting drinks for anyone (I am referring to the children – no alcohol intended). I was unconcerned about what I ate, when I ate, and where I ate. I may not have even have used a plate. I don’t recall. And it doesn’t matter. Luxurious. 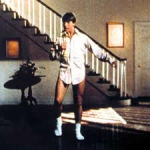 Okay, so it’s not quite Tom Cruise dancing in his underwear in an empty house. But there is plenty of Summer Camp left. And I am feeling pretty crazy. Movie photo courtesy of Google. You must love being home alone too – right? What crazy things do you do when you are home alone? 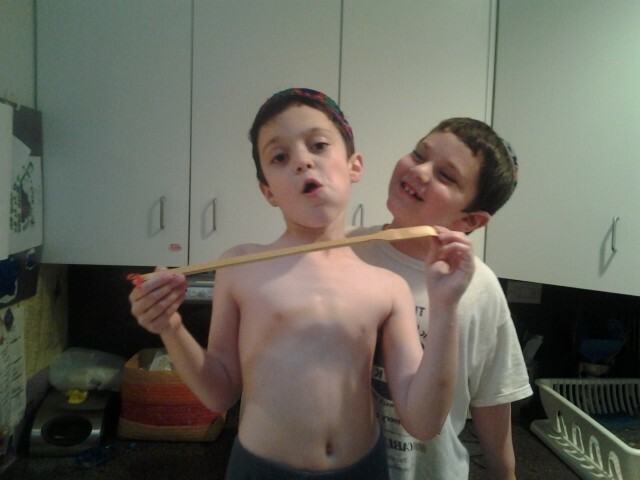 The Fabulous Baking Bernstein Boys! That is our new moniker. Kindly refer to my boys and I as such. Let me tell you of our exploits and you will surely agree we are worthy of such an esteemed title. My boys and I entered the kitchen, and together, we produced a cake. It gets better. The cake was edible. Shooting for the moon there – I know. Anyway, success becomes much more achievable if you have no standards and low expectations. Let me back up. Yesterday, I decided I was going to take my rapidly browning bananas and make a cake (http://larrydbernstein.com/bake-me-a-cake/). It was a hasty decision for this self-proclaimed unskilled cook. 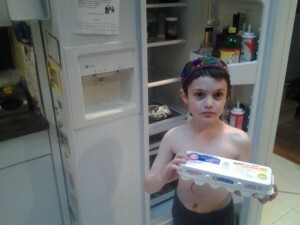 While driving to get BR from karate, I asked SJ if he wanted to join me in baking a cake. After answering a few of his questions (Who is going to make a cake? Why are we making a cake? Who is going to eat the cake? ), he said, “Sure!” He suggested we ask BR. I was skeptical. BR rarely is interested in helping me prepare dinner. On the way home from karate, SJ and I asked BR if he wanted to help us make a cake, he consented – after a series of questions (Why are we making a cake? Who is going to eat the cake? Is mommy going to help?). I made an executive decision. I would add an extra cup of milk and another egg. We had sugar, flower, eggs, bananas – I figured everything else was optional. 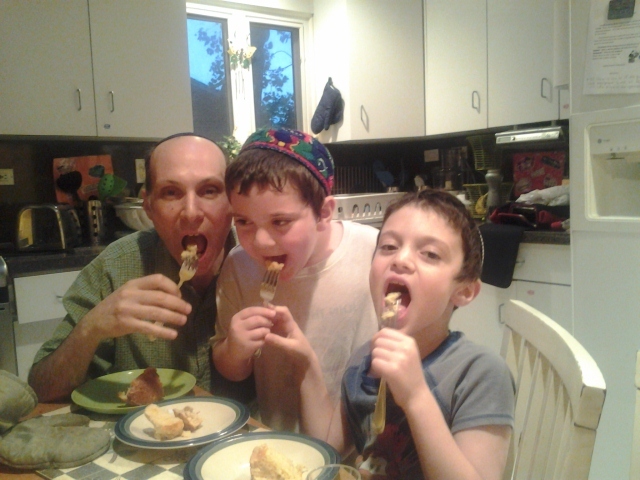 Together the Fabulous Baking Bernstein Boys toiled – we gathered the ingredients we had. We took out the measuring utensils. We poured in the ingredients. We mixed the concoction, poured it into the pan, and placed it into the oven. One hour and fifteen minutes at 325 degrees – just as the instruction said.After eating some of the leftover batter, each of us bakers went off to do his own thing. I ran into the house, turned off the oven, and gathered my family. Plates, forks, and slices of cake were served. Fabulous Bernstein Baker Boys sample their fare. Oh well – more for me. I like banana cake better than them anyway even if it is dense as a rock. It was one o’clock in the afternoon during the middle of the week. I was not giving writing instruction, engaging in literary discussion, overseeing group work, or even watching the clock anxious for an unruly class to be dismissed. Instead, I sat in the third row and watched a performance. While, it was not quite Broadway, I was mesmerized throughout the entire twenty minute production. I did not check my cell phone, consider grading papers, or mentally review a piece I am writing. It was SJ’s kindergarten graduation. The children sang and danced and said the lines that their teacher had been drilling into their minds through many practices. During the performance, I wore my proud sentimental dad hat. The teacher and freelance writer hats were off. 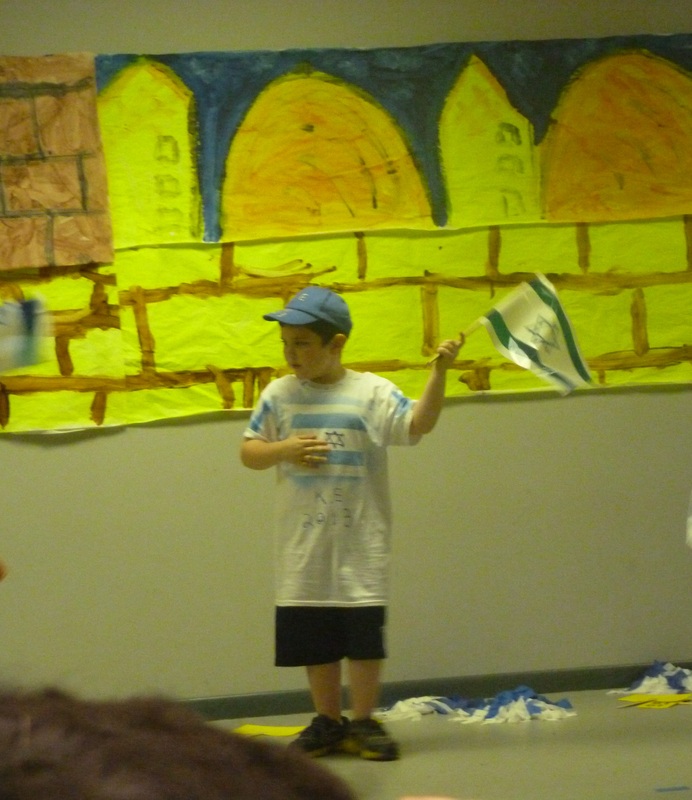 SJ performing at his kindergarten graduation. A big part of being a good employee is to be responsible, productive, and efficient. In this day and age where it still feels like job security is tenuous, it is natural to feel pressure to constantly be on. Therefore, some may be thinking, while a kindergarten graduation is sweet, is it worth taking a day off from work for this? My internal debate over this question lasted seconds. I had the time, and this is exactly what I wanted to use it for. Something has to give. And ultimately, each of us has to make his or her own decisions on how to balance family and work. There is no right answer. While I feel some sense of contentment at work, sometimes, I think I could and should be further along in my career. I question whether I am reaching or on track to reach my full potential. Isn’t part of my job as a parent to demonstrate a work ethic? Then, I wonder if I made more money, would my family be better off? It certainly would relieve certain stresses (and bring others – I know). My job allows me to be home early. For three days a week, I am the parent in charge. Dinner, homework, bathing are all my responsibility. While this may leave me grunting and frustrated at times, I enjoy the bonding time and recognize its importance. I know my boys. I know their best friends’ names. I know their favorite television shows. I know what they like to read. It’s nine o’clock and the boys are in bed (normally). It should be time for winding down – maybe watch some television, read, surf the net or talk with my wife. However, I don’t take this luxury. Instead, part two of my work day begins. It’s time for lesson planning, grading papers, or writing an article, blog post, etc. So, I struggle like many others with balancing work and family. I strive to give my children the best of me and find meaning in work. Either way, I am happy to sit in the third row knowing that is where I should be.